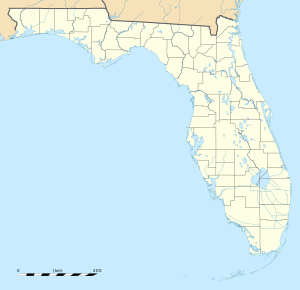 Duke Field (IATA: EGI, ICAO: KEGI, FAA LID: EGI), also known as Eglin AFB Auxiliary Field #3, is a military airport located three miles (5 km) south of the central business district of Crestview, in Okaloosa County, Florida, United States. Although technically part of the larger nearby Eglin Air Force Base complex, today Duke Field is essentially a small air force base in its own right. Primarily an Air Force Reserve Command (AFRC) installation, Duke Field is hosted by the 919th Special Operations Wing (919 SOW), which operated the MC-130E Combat Talon I aircraft until 2013 and currently operates the MQ-1 Predator, U-28 and C-145A aircraft. As an AFRC unit, the 919 SOW is operationally gained by the Air Force Special Operations Command (AFSOC), headquartered at nearby Hurlburt Field. The 919 SOW previously operated the AC-130A Spectre gunship ( 711 SOS) aircraft prior to transitioning to the MC-130E in 1995. The installation is named for 1st Lt Robert L. Duke, who died in the crash of a Curtiss A-25A-20-CS Shrike, AAF Ser. No. 42-79823, near Spencer, Tennessee on 29 December 1943. He was assigned as Assistant A-3 to the Proving Ground of the AAF Proving Ground Command at Eglin Field, Florida, now Eglin Air Force Base. The Duke Field installation is about 12 miles (19 km) north of the Eglin AFB East Gate on State Road 85. Duke Field has two asphalt paved runways: Runway 18/36, measuring 8,025 x 150 ft (2,446 x 46 m) and Assault Runway 180/360, measuring 3,500 x 60 ft (1,067 x 18 m). Although technically an auxiliary field to Eglin AFB, Duke Field is essentially a self-contained installation. The airfield has its own air traffic control tower, aircraft rescue and fire fighting (ARFF) facilities, instrument landing system (ILS), TACAN and support infrastructure such as a large flight line/ramp area, hangars, maintenance facilities and other operational and administrative support buildings. Duke Field was one of the first auxiliary fields built on the Eglin Field / Eglin AFB complex. Clearing and grading began 23 January 1941, with the first building foundations laid on 15 February 1942. Field 3 was used as a training base by the Doolittle Raiders in 1942. Shortly after the end of World War II, the field was one of several sites used in the production of the 1949 feature film Twelve O'Clock High. In the 1950s, Duke Field became home to the 3205th Drone Group, which operated radio remote-controlled B-17s and F-80s that were used for gunnery and missile practice over the Gulf of Mexico. They were also used in the nuclear test program by flying the unmanned aircraft through atomic detonation clouds to gather fallout information. A large hump-backed steel hangar, the "Butler Hangar", 160 feet (49 m) X 130 feet, transported from Trinidad (probably from the former Waller Air Force Base, closed 28 May 1949 due to budget cuts), was erected at Auxiliary Field 3 between 1 April and ~10 July 1950, by personnel of Company 'C', 806th Aviation Engineering Battalion, under Captain Samuel M. Cable, and the men of the 550th Guided Missiles Wing. Project Officer was Captain Clarence A. Ebbert of the Proving Ground Command Installations Division. An additional four feet of roof clearance was added to accommodate B-17s in the 21,000-square-foot (2,000 m2) structure. Concrete block buildings, 160 feet (49 m) X 40 feet, were erected on the flanks of the hangar. Concurrently, the 8,000-foot (2,400 m) runway was widened to 100 feet (30 m) and additional parking ramps were constructed, with 117,327 cubic yards of dirt excavated. The new ramps and runway expansion consisted of asphalt over a crushed shell base. In 1960 and 1961, in preparation for the Bay of Pigs Invasion, Duke Field was host to 'sanitized' Douglas C-54s and Curtiss C-46s used for transporting personnel, armaments and supplies between US bases such as Homestead AFB and Opa-locka Airport and CIA-run bases in Guatemala and latterly Nicaragua. A unit at the field was responsible for 'sanitizing' and adapting about 20 Douglas B-26 Invaders for use by Cuban exile aircrews during the invasion. A few T-33s and C-130s were also prepared for use in the conflict, but not used. The Development Projects Division, the Central Intelligence Agency's air arm, operated as the 1045th Operational Evaluation and Training Group, Headquarters Command, Eglin AFB, as the Air Force designated it, but which was a DPD operation out of Duke Field from late 1960 to June/July 1961. “There was a total of about 20 Polish airmen at Eglin at the time, all of them 'employed' by Lockheed, so there should be enough of them to form at least two crews.” The DPD operated independently of "the organizational structure of the project, in which it had a vital, central role, including air drops to the underground, training Cuban pilots, operation of air bases, the immense logistical problems of transporting the Cuban volunteers from Florida to Guatemala, and the procuring and servicing of the military planes." Between August and October 1970, during the Vietnam War, the Joint Contingency Task Group used AFROTC facilities at Duke Field to house US Army Special Forces troops involved in Operation Ivory Coast, a mission to rescue prisoners of war at Sơn Tây, North Vietnam. Aircraft based at Eglin AFB and Hurlburt Field involved in the training also used Duke Field daily as an operational airstrip to maintain a low profile. With the conversion of the 919th Tactical Airlift Group (919 TAG) in 1971 to the 919th Special Operations Group (919 SOG) as the only Air Force Reserve AC-130 Spectre gunship unit on 1 July 1975, nearly $6.7 million in new construction was programmed at Duke Field through Fiscal Year 1976. Although USAF C-130 airlift units were transferred to the Military Airlift Command (MAC) in 1975, AC-130 units remained under Tactical Air Command (TAC). In 1980, Duke Field was also one of the fields used in training for Operation Credible Sport, an initiative to prepare for a second rescue attempt of American hostages held in Iran using C-130 aircraft modified with multiple rocket engines for extremely short landings and takeoffs. Most of the testing for this was done at Wagner Field (Eglin AFB Auxiliary Field #1) and it was there during a 29 October 1980 demonstration of one of the highly modified YMC-130H Credible Sport aircraft that a malfunction and hard landing resulted in the destruction of this particular aircraft. All crew aboard the aircraft survived. In 1983, operational claimancy for the 919 SOG shifted from TAC to MAC and its newly established 23d Air Force (23 AF), said action paralleling the transfer of all Regular Air Force AC-130 and MC-130 units and assets from TAC to MAC. In 1990, 23 AF was redesiganted as Air Force Special Operations Command (AFSOC) and operational claimancy for the 919 SOG shifted to AFSOC. In 1992, the 919 SOG was re-designated as the 919th Special Operations Wing (919 SOW), the designation it currently retains today. In 1995, the unit's AC-130A aircraft were retired and the 919 SOW converted to the MC-130E,Combat Talon I,the current primary model design series (MDS) aircraft operated at Duke Field for worldwide deployment. Also in 1995 the 5th Special Operations Squadron was activated at Duke Field and flew MC-130 N/P, Combat Shadow tankers. Six original Raiders were present at Duke Field, on Saturday 31 May 2008 for the culmination of their annual reunion. Three civilian B-25s in warbird markings reenacted the training take-off sessions, with personnel from NAS Pensacola as flight deck crew representing that service's contribution to the Tokyo raid. ^ Angell, Joseph W., "History of the Army Air Forces Proving Ground Command - Part One - Historical Outline 1933-1944", The Historical Branch, Army Air Forces Proving Ground Command, Eglin AFB, Florida, reprint by Office of History, Munitions Systems Division, Eglin AFB, Florida, circa 1990, page 111. ^ Angell, Joseph W., "History of the Army Air Forces Proving Ground Command - Part One - Historical Outline 1933-1944", The Historical Branch, Army Air Forces Proving Ground Command, Eglin AFB, Florida, reprint by Office of History, Munitions Systems Division, Eglin AFB, Florida, circa 1990, page 29. ^ Angell, Joseph W., "History of the Army Air Forces Proving Ground Command - Part One - Historical Outline 1933-1944", The Historical Branch, Army Air Forces Proving Ground Command, Eglin AFB, Florida, reprint by Office of History, Munitions Systems Division, Eglin AFB, Florida, circa 1990, page 53. ^ Fort Walton, Florida, "Hangar Being Built at Eglin - Metal Monster From Trinidad", Playground News, Thursday 6 July 1950, Volume 5, Number 23, page 2. ^ Trest, Warren A., "Air Commando One: Heinie Aderholt And America's Secret Air Wars", Smithsonian Institution Press, Washington, D.C., London, 2000, Library of Congress card number 99-053643, ISBN 978-1-56098-807-6, page 83. ^ Leeker, Dr. Joe F., "Air America at the Bay of Pigs", Special Collections, University of Texas - Dallas, updated 4 March 2013, Footnote 84, page 12, E-mail dated 9 December 2009 kindly sent to the author by Franek Grabowski. ^ Fort Walton Beach, Florida, "Gunship Conversion at Duke Means More Jobs, Money", Playground Daily News, Thursday 3 July 1975, Volume 30, Number 126, page 7B. This page was last edited on 5 April 2018, at 22:45 (UTC).